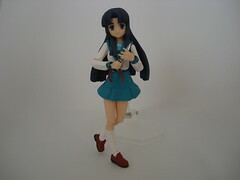 Asakura is a standard Haruhi-style figma, with the figma base, set of figma hands, and an extra face. 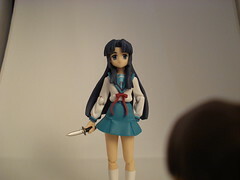 Also included is the knife she used to threaten poor Kyon with. 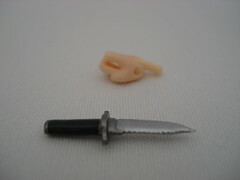 The hands for holding accessories are of a slightly different mold than the usual ones, as they were molded to hold the knife, so the the thumb is slightly extended. 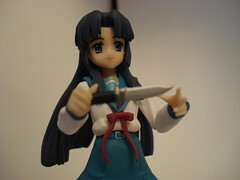 Asakura’s extra face is a smiling face with closed eyes so you feel at ease as she is stabbing you violently. <Asakura> I’ve grown quite tired of observing a static subject. 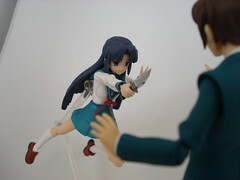 <Asakura> That’s why I’ll kill you and see how Haruhi Suzumiya responds. <Kyon> No wait, what’s going on here? 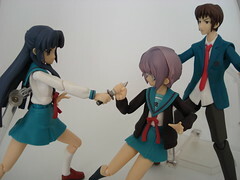 <Kyon> Why is Asakura trying to stab me with a knife? <Kyon> Hold on a sec, what did Asakura say? 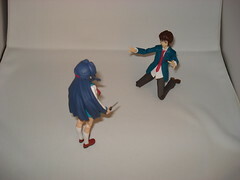 <Kyon> Kill me? 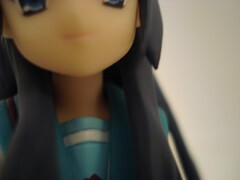 Naze? Why? For what reason? <Kyon> Stop joking around! That’s really dangerous! 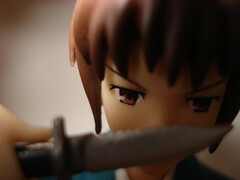 <Kyon> A fake would be enough to scare anyone! <Asakura> You think that this is a joke? <Asakura> You don’t want to die? You don’t want to be killed? <Asakura> I really don’t understand the concept of death for organic life forms. <Kyon> I don’t get it! It’s not funny! <Kyon> Just put that dangerous thing down! 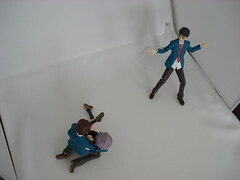 <Kyon> Are you really okay? 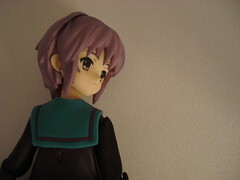 <Nagato> Processing power was redirected to data manipulation and transformation. 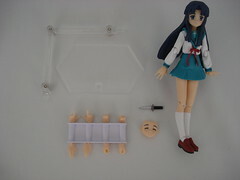 <Nagato> The regeneration of this interface was placed in queue. 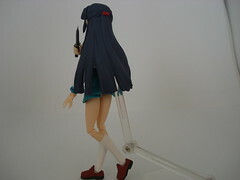 <Nagato> It is running now. 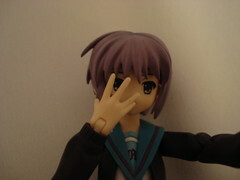 <Nagato> I forgot to reconstruct glasses. <Kyon> I’d say you look cuter without them. 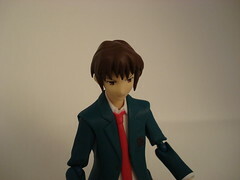 <Kyon> And I’m not really a glasses man. <Nagato> What is a glasses man? 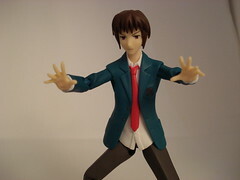 <Kyon> …nothing! I’m just babbling. 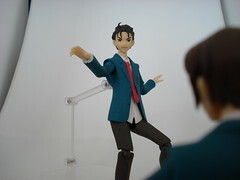 <Taniguchi> Uiiiisu~ WAWAWA Wasuremono~ UWA!! Your other option is to pose her without the stand, which proves to be difficult, since moving her head even in the slightest shifts her center of gravity so drastically (because of the weight of her hair.) 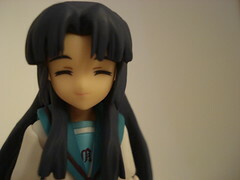 Taniguchi’s face also seems to be able to be switched, but for some reason, his bangs don’t come off. This makes it difficult to take off his face, but it doesn’t matter right now since he doesn’t have any alternate faces. Awesome review. 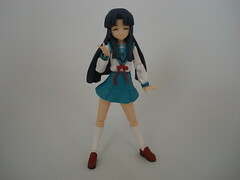 I have an order for Asakura Ryoko too.